The 2nd Version of my dehydrator is a keeper. Been cranking out some hefty sheets of fruit. Haven't stacked trays yet; still working out some details. A couple years ago, our dear neighbors from our old neighborhood gave us a zillion sour cherries from their tree. The Mrs. pitted and tossed them in the freezer and that's where they've been - for at least a couple years. The Mrs. was kind enough to let me have the fruit of her labor for a dehydrator challenge. I sugared them a bit (ca. 1/2 C per huge batch shown) and lay them out for a dehydration session. They were really wet and soupy. Took about a week. But they didn't stick together, didn't get moldy. They turned out slightly tacky, well-separated and tasted like no dried cherry I've ever experienced. And, better than fresh. Check 'em out. 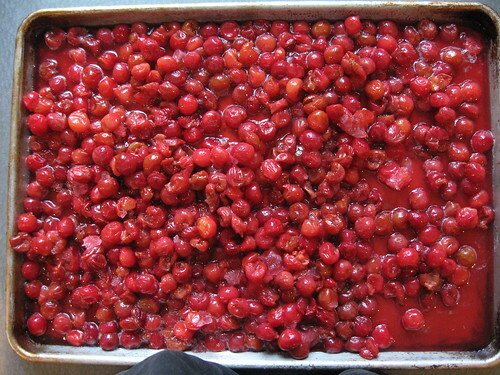 Before: The big puddle of goopy cherries. After: Please, I beg you, click the image, it's awesome. I'm jealous - they look fantastic. BTW, been using the indirect method to smoke a few chickens on weber. Will have a post up soon. We're going for a turkey breast next. These are indescribable. I used to LOVE Trader Joe's. Although, they took forever and pitting them took another forever. 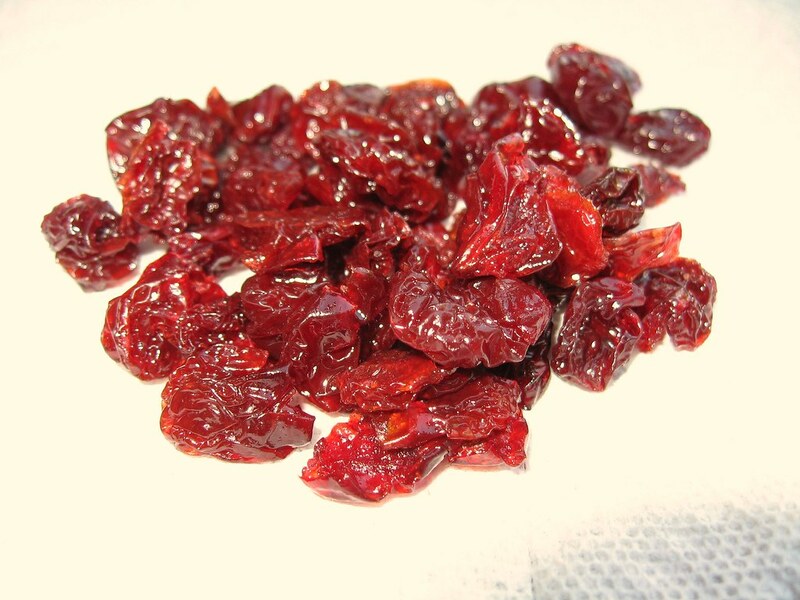 I'm considering trying to squash some cherries with the pits in them and when they dehydrate, I can just brush away the seeds.?? Go for the Turkey! You'll never do it any other way. It takes a lot of space, but, if you can, try to brine it in a trash bucket lined with a trash liner. Because of the displacement, it takes much less brine than you'd think. The toughest part is finding a place to put it. In the winter, most nights you can just put it outside. Summer's tough. Brining makes a turkey impossible to dry out. However, if you use a Butterball, they're so injected with stuff, they can't dry out either. And, despite the popular hatred of the Butterball, I love 'em. Sorry I never got back to your email earlier, got busy and distracted. You're right, the image is awesome. Thanks Betty, Close-ups of food are tough. Didn't mean to pat myself on the back so hard, I was pretty proud of that one. Sharpened it a tad using the flickr tool Picnik. First time a sharpen tool ever improved an image for me.